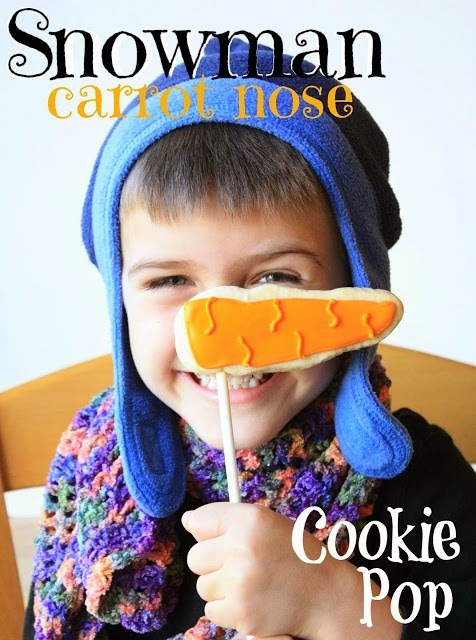 I have another fun treat for you today:) A carrot nose cookie pop! The best part is that it's very easy to make! I used my favorite sugar cookie dough and a carrot nose template I made from heavy paper. I placed the template on the rolled out dough (I roll it out pretty thick, 3/8-inch), cut out the cookies with a sharp knife and put them on the cookie sheet, leaving room to insert the sticks. With a small, sharp knife I made a tiny slit at the spot on the cookies that I wanted to insert the sticks(about an inch from the wide end), and then gently inserted them about halfway in. I placed the baking pan in the freezer for about 15 minutes and then baked the cookies at 350 degrees for about 20 minutes. When the cookies cooled, I used orange royal icing with a #3 tip to outline the cookie. After the outline dried for about 15 minutes, I filled the carrots with the royal icing, thinned out a bit with water. After about an hour of drying, I added the details with a #3 tip and left them to dry. These cookies would be very fun as a photo prop (as you can see) and then offered as a treat...double pleasure! They would be the perfect cookie pop to make any time during the entire winter season. Have Fun with your own munchkins and make some Carrot nose cookie pops! You are so dang amazing. I love your cookies!!! And your little Munchkins are adorable!!!! These are cute and so are your little ones. Even if your youngest didn't cooperate, he's too cute to be upset with. Love your ideas! I love these carrot cookies, Sue! Your two munchkins pictured are so adorable!! They are so lucky to have you as a grabdma :) That said..no, you didn't miss the next part. I wrote it..but was told I squished everything in to end it and it needed more details..so it will be in two parts soon. Geesh...it'll never end lol It was so much easier to write when I was going through that bad time - it was my 'binky', now I write it in spurts..no flow. They are just darling Sue! The cookies are soo cute too. Your creativity amazes me. What a fun idea and such cute photos. I know the feeling with the uncooperative models :) He's got the most gorgeous blue eyes! Love your carrot nose idea! My son loves this carrot in the form of cookie pops! look up the definition of awesome creative cute food. you will find a picture of yourself.